An emblem is quite important here in Japan. It is used to identify a family or an individual. Today was a special day for our Ikebana lessons. First, we had our lessons in our sensei's house. Second, not only that we were also able to use her beautiful vases, I was able to use a vase which is an emblem of an old temple in Kyoto. The emblem is a one-layered chrysanthemum. This is the same design used the official symbol of the emperor's family. It was big challenge for me because I felt that I need to make an Ikebana to complement the emblem without overpowering it. And because it is an important part of a sacred building, I need to do some justice. I used light color materials such as pink Hiperikum and white Caspia to balance the dark color of the vase. Since the focus of the whole arrangement is the emblem, flowers were arranged around it. Likewise, the flowers were placed similar to the movement of a yarn being pulled from its tube. I also tried making an Ikebana which is usually used for Japanese Tea Ceremony. 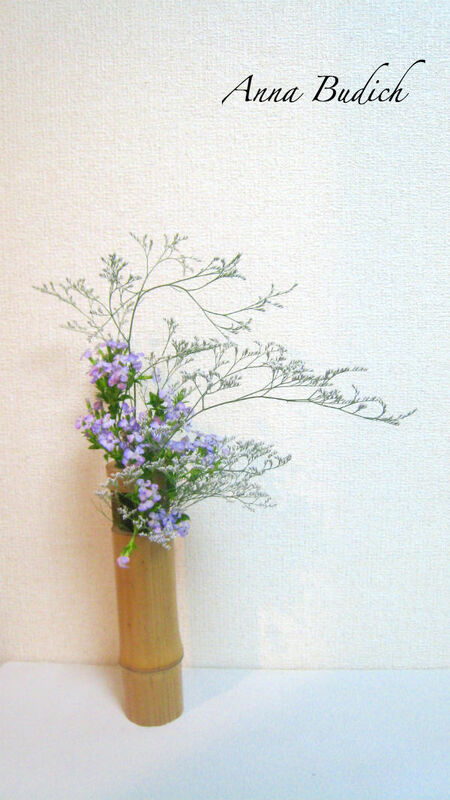 I used a small cylindrical bamboo vase which is intended to be hanged inside a tea room. White Caspia and small light purple Dianthus were used to maintain the lightness of the whole arrangement brought by the color of the bamboo. Since it is summer season, the arrangement is hoped to give a fresh feeling to its audience.